Jordan Brand gave us a glimpse of their Air Jordan 2012 collection during the official launch of their 27th signature shoe last week, which includes the “Sport Red” edition of the shoe. 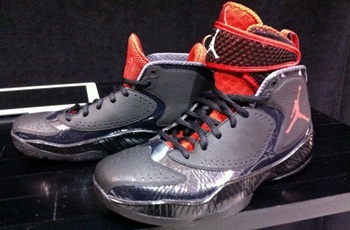 The new Air Jordan 2012 will be coming out in the “Sport Red” edition, which is officially known as the Black/Sport Red colorway of the shoe, anytime soon. The silhouette features a black base enhanced with sport red booties and Jumpman brand logo. There is now official release date yet, but words came out that this one will be coming out really soon so watch out for it!